"Yamadera, an amazing temple built in the side of a mountain. It consists of about 40 very beautiful buildings, and was first opened in the year 860, during the Heian Era. In 1689, Matsuo Basho -- a famous master of haiku -- visited Yamadera. " In ancient Japan it was believed that huge rock faces such as those at Yamadera, represented the boundary between this world and the next. It is said that the Buddhist Priest Jikaku Daishi Ennin began cutting away at the rocks in 860ad to build the Konponchudo - the main temple building of Yamadera. This building - reconstructed in 1356, houses an 800 year old wooden Buddhist image and the 'Flame of belief' which has been burning constantly at Yamadera for over 1000 years. The Konponchudo is the first building one passes on the 1100 step climb to the Oku-no-in, the uppermost of the 40 temple buildings. The stone steps wind their way through the trees and rocks and pass through the large wooden 'ni-o-mon' gate around halfway. Shortly after the gate, the path divides in two, the left route leading to a lookout platform commanding spectacular views of the valley below. The path straight ahead leads to the Oku-no-in. The Risshaku-ji (Ryushaku-ji in Oku) is a mountain temple with long paths through dark, old cedars and rocky pathways. The number of steps down, for example, from the summit (Oku no In) to the main building of Risshaku-ji count out to 870 (according to the Bashouan web site). The crags there are of volcanic rock and rather porous. There is a possibility that Basho is speaking about a sense that these rocks mute the sound of the cicadas in comparison to how they sound in the forest. Below are some pictures of the crags ("iwa") that he refers to. In the first you can get a sense of scale, and if you look closely, a stone lanter on the path gives you a sense of the nature and narrowness of the walk. In the second, the volcanic characteristics of the rock are quite clear. The third is a large crag near the main building of Risshakuji. "Cicadas' voices merge together at an old temple." 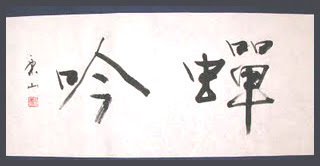 Sengin 蝉吟 (1642 - 1666) "Cicada poet"
寛永19年（1642年） - 寛文6年4月25日 25th day of the 4th lunar month. 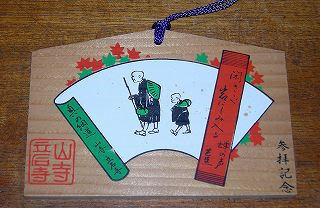 Basho was of a poor family and was sent to the Todo family to become an attendant to the young lord Todo Shinshichiro 藤堂新七郎 (Toodoo Shinshichiroo) at age 13. Sengin was the son of the head of the family and Basho studied with him in Iga Ueno, but Sengin died very young at age 25. Basho took his bones to Mount Koyasan to have them burried. Basho then went on to Edo to start his own career as a haiku master. He always kept his young master in mind all his life. cicada here becomes his kakekotoba for his friend, since it was close to the day of his death memorial (there is confusion about the dates), but it was 23 years after his death. 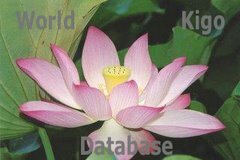 The Todo family 藤堂氏 had always been involved in waterworks, construction of canals and freshwater supply for the towns. They were also famous for their skills in building castles and stone walls. This is just one example, the famous "hall thrown into the rocks", Nage-Ire Doo.
. Matsuo Basho visiting Temples . Written at temple 伊勢の菩提山 Bodaisen（ぼだいせん）Jinguuji 神宮寺 Jingu-Ji in Ise, Mie prefecture, close to the famous shrine Ise Jingu..
. . . CLICK here for Photos ! This temple has been founded by waka-poet and priest Saigyo, but has fallen to ruin when Basho visited and there was no trace of the former temple left. Today there is a haiku memorial stone with this haiku by Basho. tokoro imo 野老芋 yam potato (Dioscorea tokoro), a kind of yama-imo, Dioscorea opposita, a kind of YAM, and not the satsumaimo, the sweet potato. do the children cry at night? take a pee at night? Literally, a "little priest" (kozoo) is involved. However, in Japanese this expression can mean any little boy. I wonder if just any little boy of the poor village would have a fan with his name on? I am inclined to read this as "little priest", priest apprentice, young monk, since the sceen is set in a temple. Thanks Gabi (excellent blog entry). And thank you Basho and mountain-temples everywhere. Gabi, i saw no place to comment on the bashou ku above, but if you give me a japanese date for it, i can check a book by yamamoto kenkichi quickly and see if anything is written about it. resounds blurred in the fog. 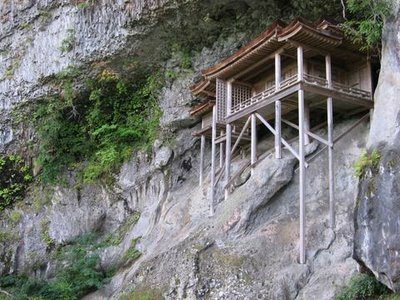 Priest Ennin tried to built a temple at the mountain 長嶺山 near the waterfall, but could not succeed the first time. He continued his pilgrimage in Tohoku, toward the mountains of Dewa and in860 founded the famous Yamadera 山寺. On the way back he was again stopped by the powerful energy of the waterfall and the forest and this time carved a statue of Fudo Myo-O himself. He established this temple as the "Oku no In" of Yamadera.